She is either taking a subversive jab at the mayor of New York or is extremely passionate about the recovery efforts following Hurricane Sandy. 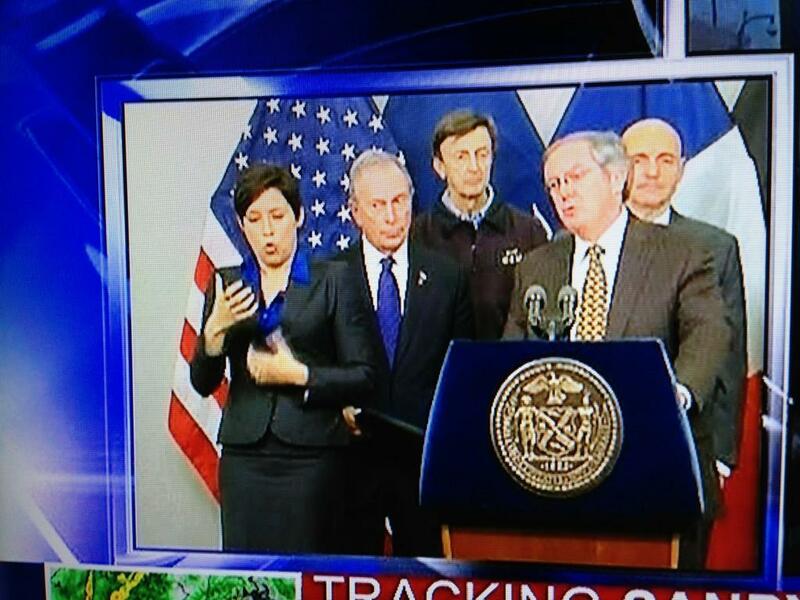 Either way, Lydia Callis is now the world's most talked-about sign language interpreter. Callis has captured countless hearts and minds with her animated translations of press conferences on hurricane Sandy and its fallout, rolling her eyes and puffing out her cheeks as she stands next to the stone-faced Mayor Michael Bloomberg. She sends the message with her hands. But she tells the story with her face. Callis' exuberance during bleak times has garnered attention online and in social media, where she has been declared the winner of Hurricane Sandy. National Public Radio calls her a "bright light during dark news." New York Magazine compares her facial expressions to a "guitarist during a blistering solo." Check out this collection of images of Callis mid-message. At times she appears to be emulating movie characters ("Are you talkin' to me?") or adding layers of emotion absent from Bloomberg's doom-and-gloom messages. Alright, we'll say it. There's a slight chance Callis is having some fun at the mayor's expense. It is a small chance, almost non-existent considering the circumstances. Get all the buzz before it goes viral - follow @ydailybuzz on Twitter!